Synthetic peptide within Human ATF2 aa 50-150 (N terminal). The exact sequence is proprietary. Our Abpromise guarantee covers the use of ab32061 in the following tested applications. WB 1/10000. 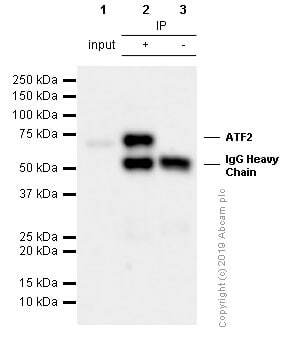 Detects a band of approximately 70 kDa (predicted molecular weight: 54 kDa). ab32061 (purified) at 1/500 dilution immunoprecipitating ATF2 in HeLa (human cervix adenocarcinoma epithelial cell) whole cell lysate. For western blotting, VeriBlot for IP Detection Reagent (HRP) (ab131366) was used for detection at 1/1000 dilution. Publishing research using ab32061? Please let us know so that we can cite the reference in this datasheet. There are currently no Customer reviews or Questions for ab32061.